The Russian military has seen not only glorious victories, but also bitter defeats. Some of these resulted not only in the loss of large amounts of territory, but even called into question the country’s continued existence. Russia Beyond presents a list of Russia’s most devastating defeats. In the early 13th century, Mongolian armies found the Russian state fragmented and unable to resist the unified and cohesive Asian invaders. One by one, the principalities fell under the Mongol onslaught that was marked by tremendous pillage, destruction and the annihilation of a large part of the population. For the next several centuries, the Russian principalities were politically and economically dependent on the Mongol Empire, and it took dozens of years to restore the ruined economy and culture. Russia struggled against a serious setback in its development, lagging far behind European countries. The invasion completely rewrote the political map of the Russian state. Kiev, which was taken by the Mongols in 1240, never regained its status as the most important city in Ancient Rus. Western Slavic principalities, such as Smolensk, Kursk and the territories of modern Ukraine and Belarus, fell into the sphere of influence of the strengthening Lithuanian state, which eventually absorbed them. A time bomb was in the making, however, because these lands became a bone of contention and reasons for numerous wars between the Russian state and the Polish-Lithuanian Commonwealth. Even in the 20th century, disputes between Poland and USSR concerned several of these territories. Karl Briullov. Siege of Pskov by Polish King Stefan Batory', 1843. 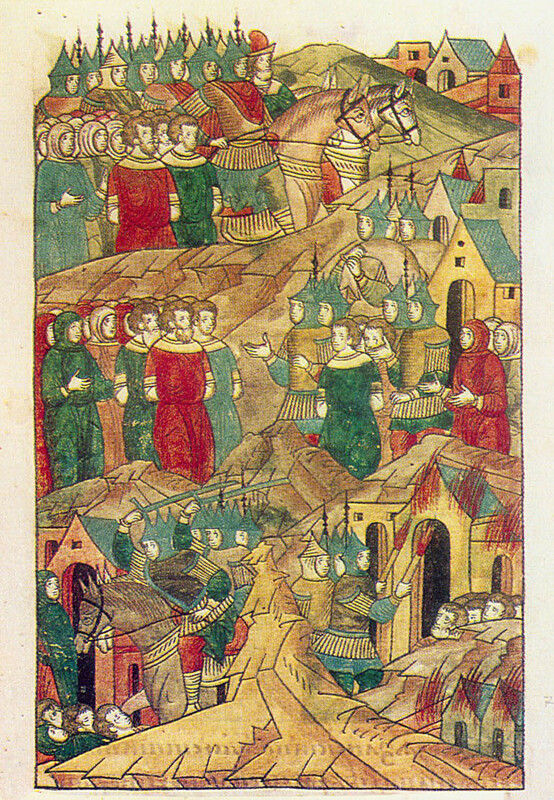 Ivan IV, widely known as Ivan the Terrible, started a war against the fading Livonian Confederation in order to capture its main ports and to gain a foothold for the Grand Duchy of Muscovy on the Baltic coast. This was very important for the growing Russian state, because its access to the Baltic Sea had been limited to a small and mostly undeveloped piece of land on the coast of the Gulf of Finland. 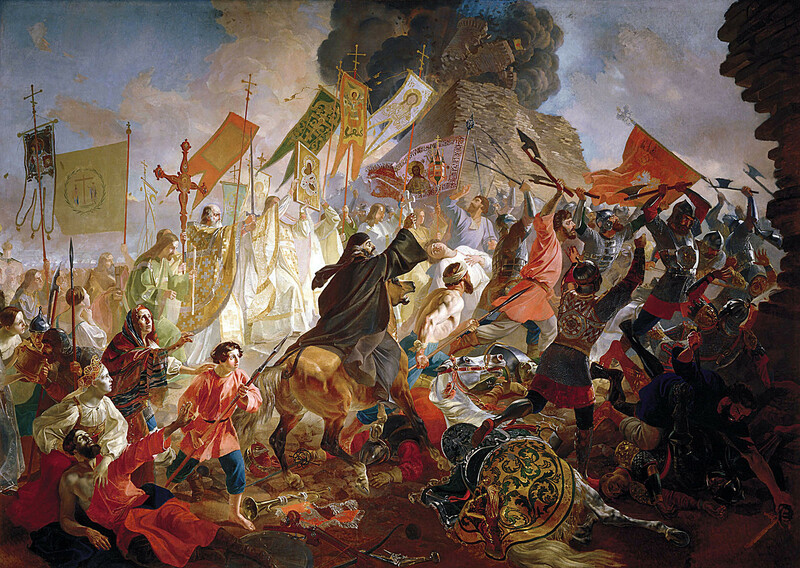 The first period of the war was successful for Ivan IV, and his troops took significant parts of the Livonian Confederation – the lands of modern-day Latvia and Estonia. Other great powers, however, were not happy to observe the growing power of its eastern neighbor. For many years, Russia was at war both with Sweden and the Great Duchy of Lithuania that in 1569 united with Poland. The exhausting war continued for more than 20 years, and ended with a major defeat of the Russian state. The country’s economy was ruined, and the northwestern territories were depopulated. All lands originally taken from Livonia were lost and returned. Even worse, Muscovy lost territories in Finland, and most of its coastal possessions on the Gulf of Finland. Only a small piece of land on the Neva estuary remained in Russia’s possession, but it couldn’t provide proper access to the sea. Now, instead of the weak Livonian Confederation, Russia had new and powerful enemies on its western border: the Polish-Lithuanian Commonwealth, and the Kingdom of Sweden. It took many years and resources to deal with these problems later - during the Great Northern War (1700-1721). Peter the Great was successful where Ivan IV failed – he crushed Sweden and annexed its lands along the eastern Baltic (Estonia, Livonia and Ingria) under the terms of the 1721 Treaty of Nystad. In 1711, however, the war was far from over, and the Tsar found himself in a life-threatening situation that almost ended with the destruction of his entire army. 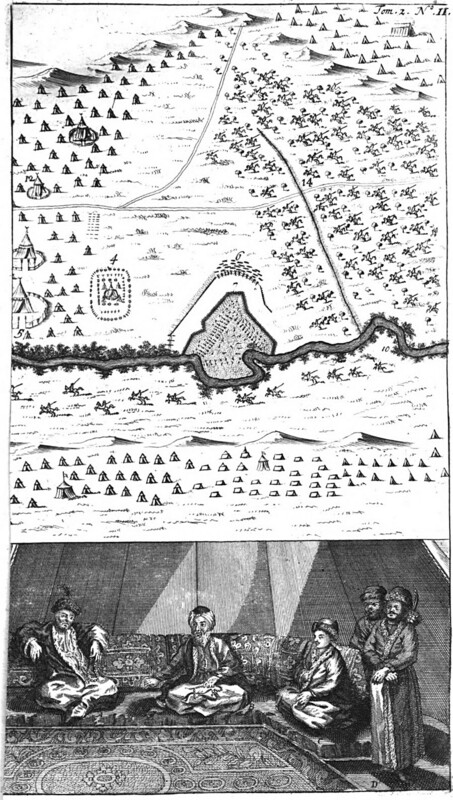 After Russia’s spectacular victory at Poltava in 1709, Sweden’s defeated King Karl XII fled to the city of Bendery in Bessarabia, then under Ottoman rule. Tough negotiations between the Tsar and Sultan Ahmed III over the fate of the Swedish king came to an impasse. The Sultan was eager to eject the Russians from the Azov fortress on the coast of the Azov Sea, which Peter the Great captured in 1695-1696 in order to give Russia access to the Black Sea via the Kerch Strait. In 1710, the Ottomans treacherously declared war on Russia, which culminated with the Tsar’s Pruth River Campaign. In 1711, however, the Russian army of 38,000 led by Peter the Great was surrounded by 190,000 Ottoman and Crimean troops in Bessarabia. To avoid destruction, Peter was forced to accept the Sultan’s humiliating terms, which were codified by the Treaty of the Pruth two years later. Russia ceded Azov to the Ottoman Empire, destroying all fortresses on the Azov Sea coast, and thus losing access to the Black Sea. In addition, for nearly 20 years Russia lost control over the Zaporozhian Cossacks, who fell under Ottoman rule. Still, the defeat’s worse consequence was the destruction of Russia’s first navy – the Azov Flotilla. Hundreds of large and small ships were destroyed; some were sold and the fate of others remains unknown. As far as the southern direction of its foreign policy, Russia was forced to start from zero. 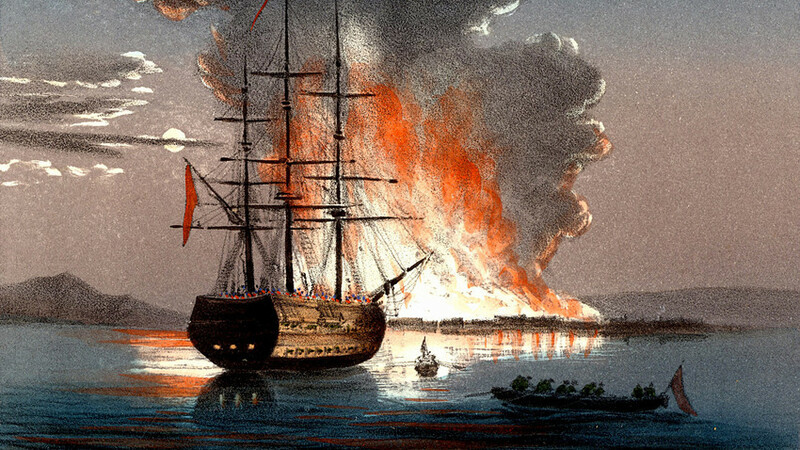 Burning of the redout at Kale (Canakkale) at the mouth of the Dardanelles (the Hellespont) during the Crimean war. Hand-coloured lithograph published in Italy 1857. 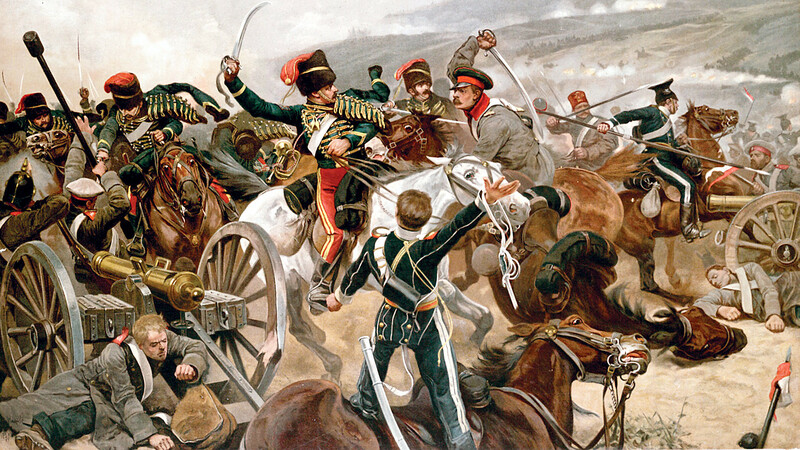 In a way, the Crimean War was similar to the Livonian War: Russia successfully started a fight with one weak enemy, but ended the conflict suffering defeat at the hands of a coalition of great powers. According to the Treaty of Paris (1856), Russia didn’t lose much territory, but it lost the right to have a fleet on the Black Sea. Thus, Russia abandoned its claims to protect Christians in the Ottoman Empire, ceding that right to France. It also lost influence in Moldavia, Wallachia and Serbia. In general, the war severely undermined Russia’s international standing. The Empire’s financial system suffered most. With huge war debts, it was forced to print unsecured credit notes that led to a drastic depreciation of the ruble. Only in 1897 did the government stabilize the exchange rate by adopting the gold standard. However, the Crimean War forced the government to launch major military and economic reforms, such as the abolishment of serfdom in 1861. 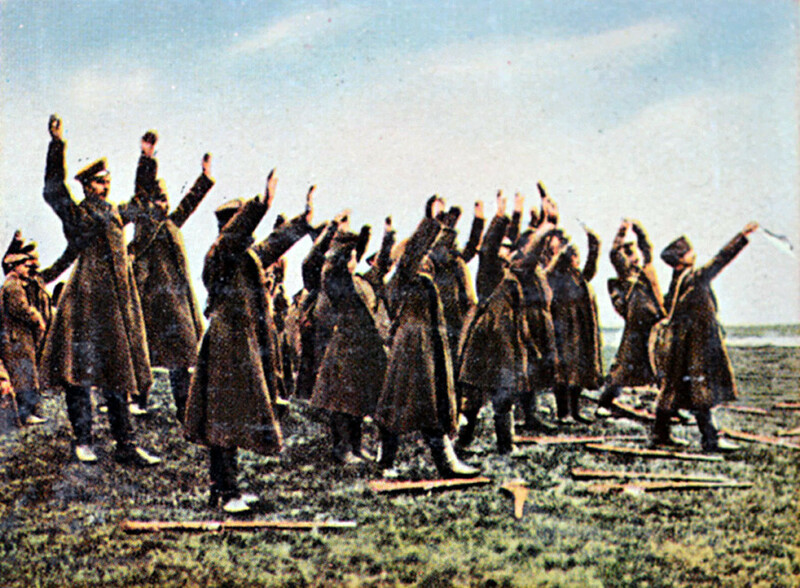 The Great War, as World War I was called by contemporaries, was a major disaster for the Russian Empire, leading to its collapse in October 1917. The 1.7 million wartime casualties were just the start of even more carnage. Even though Russia exited the war with the Treaty of Brest-Litovsk on March 3, 1918, the Civil War plunged the country into even greater violence and destruction. Due to its separate peace with the Central Powers, Russia didn’t get a seat at the peace talks, even though its impact on victory had been significant, especially in the war’s early stages. In the end, Russia lost about 842,000 square km (15.4 percent of its total pre-war area), which was home to 31.5 million people (23.3 percent of the Empire’s pre-war population). The Empire’s collapse led to the appearance of new states. Poland’s independence was restored, and Latvia, Estonia, Lithuania and Finland gained statehood for the first time in their history. Also, Romania took the opportunity to annex Bessarabia. Even today, Eastern Europe’s geopolitical situation is characterized with uneasy and complicated relations between countries that arose on the ashes of the Russian Empire in 1918.